Though I often work in the presence/periphery of avid birders, I haven't yet caught the bug. Thus far, my enjoyment of non-plant life has been ambient and generally inclusive. My mom recently reminded me that while growing up I had strange pets: hermit crabs, tadpoles, turtles, and rats. That's what happens when you have 3 older brothers, who themselves had a strange menagerie of "pets". Specifically, that's what happens when you have 3 older brothers, your backyard is woods, and your parents encourage outdoors discovery. I'm pretty sure the tadpoles only lasted until they had legs. They lived in a yellow notecard box, the type you own in elemetary school for word memorization. At a slightly larger than 3 x 5 size, holding approximately 2 cups of water, I thought I'd provided them an adequate pool for their happiness. But something larger than that little pool of public drinking water was calling them. I watched their growth with fascination until one morning they were gone. Though I searched all over for them, I never did find a trace. Well, it's been years since I last had the responsibilities of a pet. These days, in order to make my connection with the rest of life, I garden. And the garden brings them in. One by one, the neighborhood cats, dogs, chickens, ducks, birds, squirrels, mice, raccoons, bees, and more come calling. They come for various reasons. The chickens and ducks (our neighbors just brought home Runner Ducks) come to grub through the newly laid mulch. Raccoons come stalking the chickens. Flying birds come to bathe in the fountain and eat our dandelion seeds, vegetables, and greens. Cats slink around, stalking the birds. The squirrels come to plant walnuts and nest in the trees. And mice live in the wood pile. Lately, I've been making some very amateur observations of our avian friends. Yesterday, I saw Lesser Goldfinches eating our Giant Winter Spinach, which surprised me for two reasons. First, I had no idea little birds ate greens. The second is that of course they eat greens. So I read up on them a little and learned that they eat more than available seed when opportunity presents, preferring mashed boiled eggs, dried fruits, veggies, herbs / greens and even superfoods, such as bee pollen. 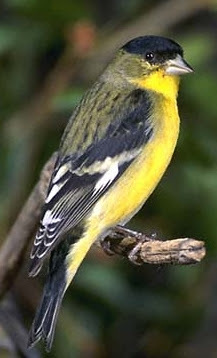 Lesser Goldfinches are found in much of North America, from Texas heading West. Here's what the male looks like, the Willamette Valley species having a back more green than black. 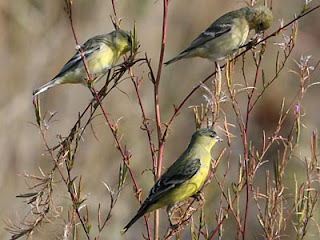 They frequently forage urban and suburban gardens, so take a look outside today and you may meet one.